This basketball coaching website is a long-standing (2001) trusted resource that provides basketball information to help youth and high school basketball coaches and players worldwide to become better coaches and players... a basketball coach's encyclopedia. 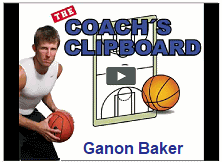 Euro Step video... from elite trainer Ganon Baker. "Baylor"... baseline OB play similar to a play run by Kim Mulkey, head coach NCAA Champs Baylor. "Pistons"... sideline buzzer beater play from NBA coach Dwane Casey. Lay-ups, Finishing at the Hoop... simple lay-ups, reverse, inside-hand, pro hop, floater, two-footed lay-ups. Defending the pick and roll - "Under", "Over", "Jump-Switch", "Ice", attack the ball techniques. Ganon Baker's Pivot and Pass Footwork Drills - (video). 1-4 Offense Play "Illini" - a Lou Henson play for the 1-4 set offense. 5-on-3 Transition Defense Drill - from Greg McDermott (Creighton). "Zip-Loop-Hammer" - another play to use with your 1-4 set. Double Stack Offense/Plays - several m2m, zone and OB plays. Bo Ryan's Swing Offense Plays - Bo Ryan's plays for the swing offense. Sherri Coale's Shooting Drills - 8 drills from Oklahoma Head Coach Sherri Coale. Pick and Roll Drills - a set of drills from TCU Coach Jamie Dixon.